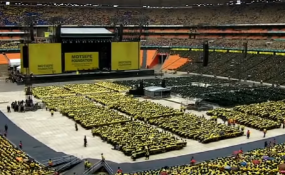 Cape Town — Thousands of people attended an interfaith prayer service at the FNB Stadium in Soweto on Sunday. EyeWitness reports that over 60 000 attended, while the SABC puts attendance at 140 000, saying that an overflow viewing deck was needed. Worshippers from the Zion Christian Church and other religious groups filled the stadium, EWN reports. Hindu, Muslim, Jewish and Christian groups led worshippers in song before the official sermons got under way. SowetanLive reports that Zion Christian Church's bishop Barnabas Lekganyane warned political leaders not to incite violence by making inflammatory remarks. In his keynote address, he urged South Africans not to vote for leaders hellbent on making empty promises. SowetanLive says there was chaos outside the 94 000-capacity venue as a large number of people, including some VIPs and media people, were barred from entering the stadium due to security concerns and fears of a stampede.